Data points to HSBC leaving the United Kingdom. The global bank is reviewing the location of its head office based on considerations such as economic importance, transparency and tax. Breakingviews has crunched the numbers to compile its own rankings. 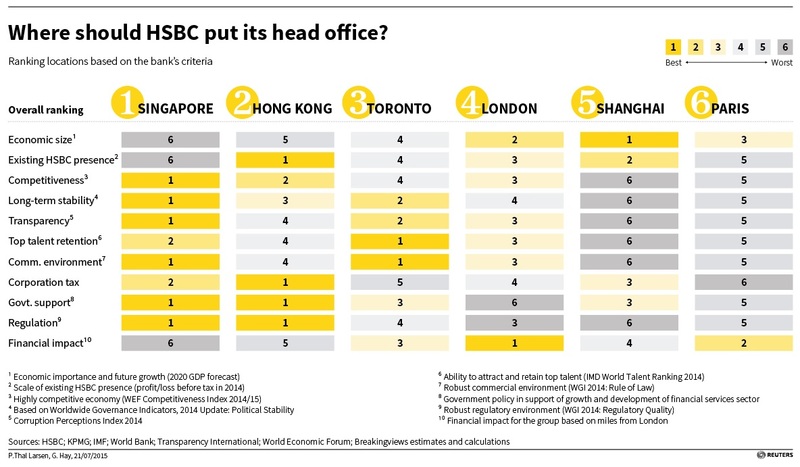 Our figures suggest Singapore, Hong Kong and even Canada would be more attractive than HSBC’s current home. The bank has said it is reviewing its location based on 11 criteria. In an attempt to approximate HSBC’s approach, Breakingviews compiled statistics for each category. We then used them to rank six cities: London; Hong Kong and Shanghai, where HSBC was founded 150 years ago; and Singapore, Asia’s other main financial hub. We included Paris as the most likely destination within the euro zone, since HSBC is big in France but not Germany; and Toronto, home of the bank’s largest presence in North America. We then added up all the scores to arrive at an overall ranking. If economic size and future growth were all that mattered, HSBC would be moving to China. The world’s second-largest economy promises by far the biggest potential increase in GDP over the coming years. But Shanghai scores poorly in matters such as transparency, competitiveness, and the rule of law. As a result, the Chinese city finishes near the bottom of the list. Only Paris does worse. The French capital is less attractive for talented staff, while its corporate tax rate of 33 percent is the highest of the six potential locations. London finishes fourth. Despite its long-established position as one of the world’s largest financial centres, the British capital doesn’t stand out on any of the chosen metrics. Even though the government has pledged to phase out the banking levy that was proving so expensive for HSBC, and is lowering the corporate tax rate to 18 percent, a planned 8 percent profit tax surcharge on banks diminishes Britain’s appeal. Toronto, meanwhile, scores surprisingly well. HSBC earned more pre-tax profit in Canada than in the United States last year. The largest Canadian city is joint top of the pack alongside Singapore when it comes to the rule of law, according to the World Bank-backed Worldwide Governance Indicators (WGI), and was also most attractive for attracting and retaining skilled staff, according to the IMD World Talent Ranking. Less surprising is that Hong Kong is also near the top of the list. HSBC’s home until 1994 remains the bank’s largest single market, while its proximity to China promises future growth opportunities. The former British colony boasts the lowest corporate tax rate among the contenders, the highest possible score for regulatory quality according to the WGI rankings, and a government that is keen to keep Hong Kong developing as a financial centre. Even so, Singapore just edges out its Asian rival. Despite its small economy and slender contribution to HSBC’s bottom line, the city-state comes top in terms of competitiveness, stability and transparency. On several other measures it comes second. Of course, any such exercise is bound to be much cruder than HSBC’s own study. It also attaches equal weight to each factor, whereas the bank may decide some are more important than others. Besides, HSBC hasn’t even said which locations are in the running. The bank’s board will also have to weigh up the impact of its decision on the rest of the bank. For example, if it picked Singapore, relocating there would be a massive snub to Hong Kong and China. Nevertheless, what is clear is that – on the checklist HSBC has laid out – it’s hard to make an empirical case for keeping the head office in Canary Wharf. If HSBC does decide to stay put, it will need a strong argument for ignoring data that seems to point East. HSBC said on June 9 it would review the location of its head office based on 11 criteria. The analysis is based on factors including economic importance and future growth; HSBC’s existing presence in the country; economic competitiveness; stability; transparency, ability to attract and retain talent; enforceability of laws; the tax system; government support for financial services; regulatory standards; and the financial impact of moving. A team comprising both external and internal members is working on HSBC’s analysis and will present its findings to its board of directors later this year.